Camel can be a bit tricky to pull off. It's a versatile neutral that works for any time of year but it doesn't agree with everyone's skin tone. It should bring richness to one's coloring, not wash you out, but there are some tricks to pulling the color off. If the camel is too close to your face it can make you look pallid, so put a color between you and it (cue chambray). Indigo chambray and camel are classic together, but throw a green field jacket over the look and you're on an urban safari. I put on my burgundy Chucks just for fun but switch up the look with a blazer, dark denim and oxfords and you're ready for a sophisticated night out. 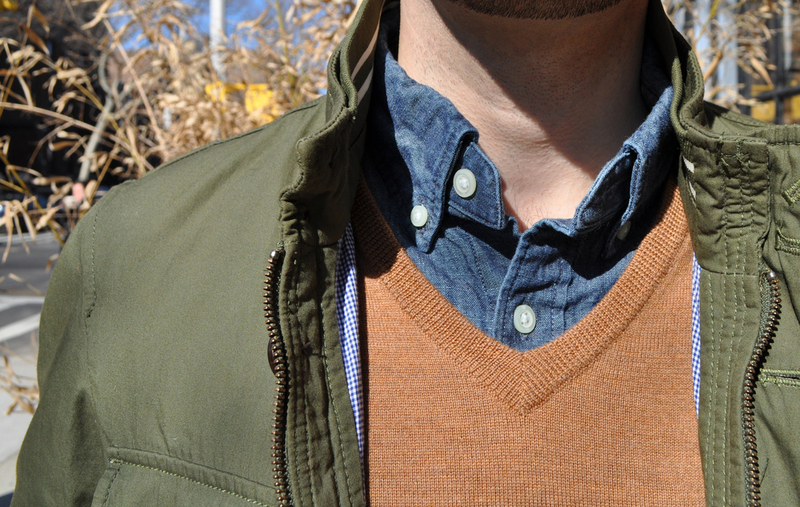 Once again, chambray is my go-to for layering under sweaters and jackets. It goes well with every color and has just enough texture to add interest without limiting you to a single color pallet.